Columbia Basin Action agencies--BPA, the Bureau of Reclamation and the U.S. Army Corps of Engineers--are half way through implementation of the 10-year hydro BiOp and have concluded that it's going pretty well. BPA Senior Policy Advisor Sarah McNary led off the BiOp pep rally at the July 10 meeting of the Northwest Power and Conservation Council in Seattle with a "soup-to-nuts look-back" of the agencies' implementation, fish stock status, and lessons learned. It's the first public view of the agencies' draft comprehensive evaluation required by the BiOp, which is itself still under remand. The evaluation includes a new draft supplement slated for release by the end of August, its second tune-up since it came out of NMFS' shop in 2008. The new additions are expected to contain many more specific habitat improvement actions, as asked for by District Court Judge James Redden, who has since retired from the litigation [NWF v. NMFS]. Corps of Engineers' spokesman Rock Peters reported on abundance trends of natural fish, and the news is generally good. Most of the interior Columbia Basin ESA-listed stocks have been "on the increase," Peters said, noting that the Upper Columbia spring Chinook have not shown a significant upward trend, but a lot of annual variation. Snake River sockeye was another stock Peters specifically mentioned as doing well, though most returning sockeye are products of an intensive captive broodstock program, but some natural fish are being produced. Peters also said hydro improvements at the federal dams in the Columbia and lower Snake have culminated in surface collection improvements for migrating smolts at all eight projects, which has reduced the time it takes for a smolt to pass the spillway from many hours to only an hour or two. The new spillway weirs that attract fish by functioning as water slides pass fish from their natural position near the surface much easier than traditional spillway gates, where fish must follow a path 40 feet below the surface to pass. He added that the region is on track to meet juvenile survival performance standards at all the dams (96 percent per project for spring Chinook and steelhead, 93 percent for subyearling fall Chinook). However, the 24-hour court-ordered spill at all lower Snake and Columbia dams that runs from April through August has reduced the number of fish barged, he said, which has diluted the "spread the risk" strategy between spill and transport the Independent Scientific Advisory Board said in 2010 should be maintained until a clearer answer is available. He said only about 25 percent of the migrating Chinook and steelhead (hatchery and wild) were transported in 2012. Smolt-to-adult return (SAR) data over the next few years should tell the region what is the best strategy to pursue in the future, Peters said. With the last surface collector installed in 2009 and the spill wall at The Dalles completed in 2010, he said adult returns in 2013 will be the first outmigration that was able to utilize all the major passage improvements. 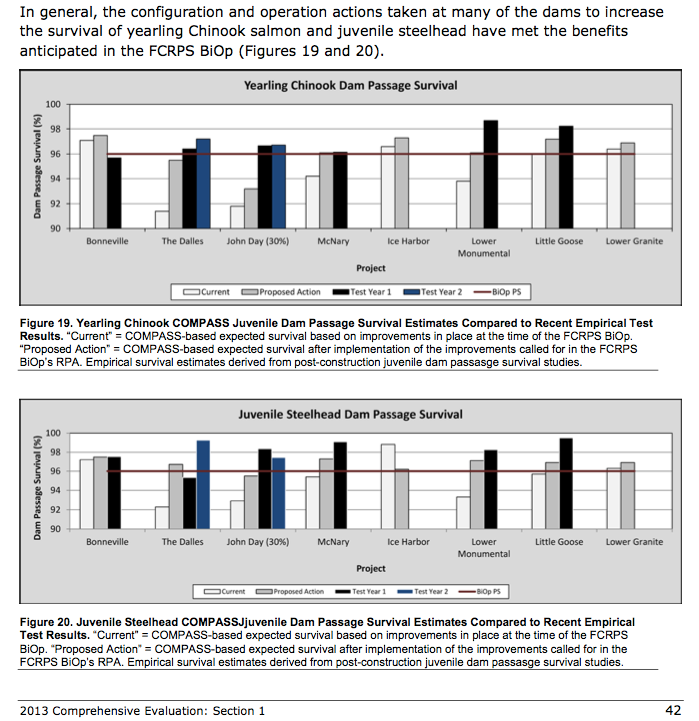 Adult passage standards have been met or exceeded by several stocks, Peters noted--Snake fall Chinook, Upper Columbia Chinook, and Upper Columbia steelhead are all doing well. However, Snake River spring/summer Chinook and steelhead have not met the adult standards in recent years, which is puzzling, Peters said, because the Corps has been in a "maintaining" operation to keep the high survival rates in place. He said the drop in performance for the Snake fish likely has something to do with what occurs in the lower river since nothing has changed at fish ladders. He said the Corps is continuing to investigate the problem. Kate Puckett from the Bureau of Reclamation reported on tributary habitat actions, which number in the "hundreds." She said the action agencies are focusing on 18 populations that NOAA said could especially be helped by habitat improvements. Based on data for the latest evaluation that has been collected by seven expert panels, Puckett said, 31 out of the 56 fish populations noted in the BiOp are on target to have habitat actions completed by 2018, and that one-half or more of the 2018 targets have been achieved for about 80 percent of the populations. But, she said, the focus on the 18 priority populations are not "simple fixes," because of legacy impacts from mining and agriculture. "If you combine the improvements we've made in the BiOp program with the achievements [habitat] we made so far, we think we are in good shape to meeting the 2018 targets by 2018," said Puckett. Focusing on BiOp actions only, she said, the agencies have been able to protect 177 kaf of water for salmon, and improve 200 miles of stream complexity, along with improving 6,800 acres of riparian habitat. Puckett said more than 2,000 miles of habitat has been opened up to salmon and steelhead in the Columbia Basin. BPA's Sarah McNary reported on the push to improve conditions in the Columbia estuary, noting that by 2013, efforts are in a "high output" phase, after the 2008 BiOp recognized that the estuary was a place where improvements could benefit all listed stocks. McNary said projects to reconnect floodplains have created more sources for food for young fish in off-channels and the mainstem as well, so the actions have benefits for all passing fish. She said the agencies are in a good position to meet the 2018 targets. McNary also touched on hatcheries, where BPA has two goals--providing mitigation as required by law, and making sure that those hatcheries are not impeding recovery of ESA-listed fish. The BiOp required that hatchery genetic management plans be produced for those operations and they have all been completed and submitted to NOAA Fisheries. The Corps' Rock Peters also provided a summary of efforts to reduce predation on listed smolts--the pikeminnow rewards program that reduces the population by about 15 percent each year is a continuing success, he noted. As for bird predation, Peters said, the Corps has reduced Caspian tern nesting habitat in the estuary from 6 acres to 1.5 acres, and built 9 acres of nesting habitat outside the basin. But the birds have been "cuddling up," said Peters, creating higher nesting densities than seen in other locations. The birds' habitat may be reduced even further, or other actions undertaken to reduce the number of tern nesting pairs to about 3,000 from the current level of 6,000. Peters said the devices built to keep sea lions out of fish ladders at Bonneville Dam are doing a good job, but harassment has a limited effectiveness. He said the marine mammals' consumption rate of salmon has dropped significantly over the past two years, and is probably due to actions by the states, tribes and NOAA Fisheries to remove sea lions. But another winged predator has been making more of a splash in recent years--double-crested cormorants, which are now estimated to be eating about 20 million juvenile salmon and steelhead each year. Peters said a management plan is in the works, with an EIS to be completed by July 2014, after which actions to deter the cormorants' eating habits could move forward.